The 152nd episode of THE FIRE AND WATER PODCAST is now available for your listening pleasure! THE FIRE AND WATER PODCAST is the official podcast of FIRESTORM FAN and THE AQUAMAN SHRINE. You can find the 152nd episode of THE FIRE AND WATER PODCAST on iTunes. While you’re there, please drop us a review on the iTunes page. Every comment helps! Alternatively, you may play the podcast using the player below or by right-clicking “download”, choosing “Save Target/Link As”, and selecting a location on your computer to save the file (48 MB). Posted in: Comic books, Firestorm #01: Original (Ronnie/Martin), Gerry Conway, Podcast, Professor Martin Stein, Ronnie Raymond. Kriss-Kross’ll make you jump! JUMP! Okay, honest show-of-hands: How many people assumed, when Shagg said they had a big announcement, that the Fire and Water Podcast was ending because Frank and I killed it on Episode 150? I knew Criss-Cross Apple Sauce. That’s the new, more culturally sensitive version of “Indian Style”. It’s interesting that you picked a Neal Adams and Rich Buckler comic. Buckler was very much in “Adams riff” mode at DC in the late 70s and early 80s. As Rob pointed out, his comic work at the time is rife with direct figural swipes from Adams. This was fine by me, as it’s gorgeous stuff. Buckler was one of the best who worked in that Adams style. He did a lot of World’s Finest around this time too, so he continued that DC house style Adams had established in the 70s with all the covers he did. I first read this Batman/Aquaman team-up in that “Best of the Brave and the Bold” mini that reprinted the Haney/Adams tales, with new covers by JLGL (PBHN). Man, Orm is one sinister looking dude! If you couldn’t guess he was evil just by looking at him, you’re blind! I always liked Adams’ Aquaman too. Haney’s definitely not quite as Zany here, but the story is just as dense. I commend Rob for doing one of his best synopsises (synopsi?) on this one. Maybe it was the cold meds? I bought the DCCP issue right off the stands. Kriss-Kross certainly was Mort-material, with no Who’s Who entry. Where’ Xum when you need him? I don’t think there is any doubt that Cindy is the Fire and I am the Water. Based on our group recording yesterday, I think we would all agree! Super stoked to shout to the world I’m in league with such a talented group of folks! Onward and upward! So with all these shows joining the network I’m wondering how many minutes between episodes? ‘Chris cross apple sauce’ has to be the most irritating bit of repetition on any podcast ever. Seriously, the desire to have children sit cross-legged is such a problem that there’s a whole, almost-rhyming expression built around it? Despite that, fun show, and congrats on the marriage of podcasts. Martin – THAT’S the most irritating bit of repetition you’ve heard on a podcast?!? With the number of shows you listen to, THAT’S the most annoying?? Really?? Oh yeah, and Martin… Chris Cross Apple Sauce. Howdy gents, this was a great show, and so was #149. I’ll comment on both episodes here, if I may. I particularly enjoyed the pure, unbridled literary power that was, Lady Cop! Ha, what an absolutely insane, and insanely fun, story. The summary was so wild that the thought of the book itself boggles the mind, and one wonders if it might be akin to seeing a god in its glory, apt to burn one out and leave naught but a dry husk behind, something too grand for us mere mortals. This announcement is great, and I welcome more Fire and Water goodness. That comment y’all read about the quality of your fans being a great rubric for judging your work strikes me as particularly true, as is the quality of your podcasting allies. You have really wonderful folks forming a community here, on both sides of the mic, and that always makes me feel quite easy about stopping by to leave a comment, no matter what it might be. That isn’t the case throughout most of the Internet. For most of the wasteland that is the Internet, I’ve begun to find the wisdom in what George Bernard Shaw said long ago: “Never wrestle with pigs. You both get dirty and the pig likes it.” I never worry about things getting ugly or dirty here (except when Shag is talking! ), and that is a really rare and excellent thing. 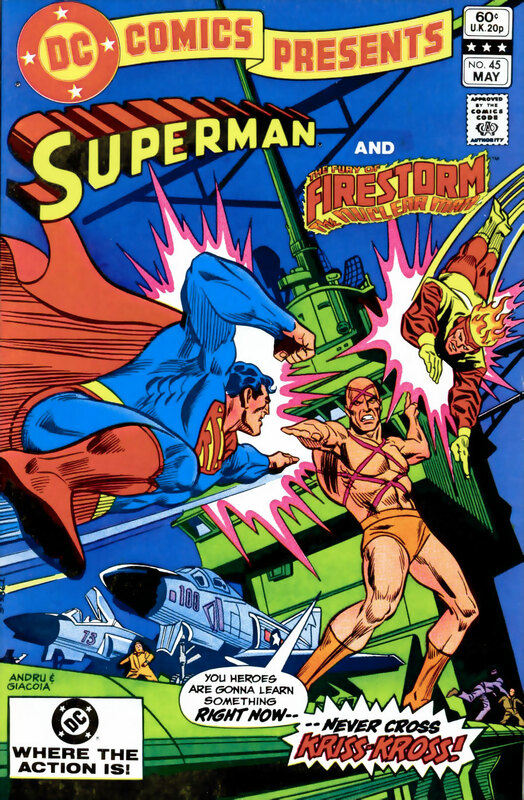 The Criss-Cross story was fun, but yeah, it does seem like Firestorm could have lifted out of it. The Aquaman team-up was also an entertaining one, but it’s a bit too ‘Zaney Haney’ for me. I actually enjoyed the pure exhaustion both of you displayed about the current Aquaman book. I feel precisely the same way, and I thought the tone of your non-responses was rather apt. I’m sorry that Bunn had such a bad experience, but I’m certainly not sorry he’s leaving the book. I’d be much happier if Jeff Parker were coming back, but I’m sure Johns will do a solid job. It’s a real shame, because the basic concept here is not a bad one. If the writing weren’t so lazy, sloppy, and grim ‘n gritty, if he hadn’t thrown in the unnecessary nonsense with Mera/Siren being antagonistic to Aquaman, this story could have had promise. The idea of a world intruding into ours and posing an existential threat, but which cannot be destroyed without the loss of innocent life (or, what should be enough for Aquaman, the loss of life in general), could produce interesting stories. These are not them, unfortunately. In those latest two issues, I did find something that I thought was a good moment. When Aquaman finds himself in the alien world, he finds a giant creature impaled by the shards of whatever-the-generically-bad-place-is-named, dying quite painfully. He’s faced with a hard choice, but he puts the creature out of its misery. That had the potential to be a strong scene. It isn’t bad, but it could have been better. There are a number of those moments scattered throughout this bloated storyline, and it seems as if Bunn and Co. focus on exactly the wrong parts of the story. We have endless repetition of the ‘oh-so-shocking’ plot twists, but the introduction of Garth to the New 52 couldn’t be given less interest or attention. Bah, I’m just glad this is almost over, and I, like you, am hoping quite fervently that Johns will promptly ignore all of this and get on with something more interesting. Ohh, and my two cents on what to Aqua-content to cover is that I’m definitely on board for anything SAG era (my buddy and I are actually talking about starting a podcast, part of which would be dedicated to my favorite Aquaman issues), or from the Adventure run. I won’t say that y’all SHOULDN’T cover the PAD run, but I will say I don’t think that I could bring myself to sit through those shows, so purely selfishly, I hope that y’all will do other things first.